The relentless pursuit of the elimination of waste is main concept behind the just-in-time or lean production system. A solid industrial engineering or discipline training is needed to think and implement innovative and effective solutions to eliminate waste. The amazing fact is that at least 95% of cycle time in a non-lean factory or office is consisted of non-value added activities! 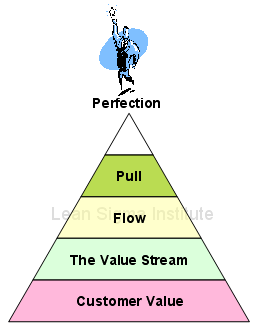 Lean thinking or principle can be applied in service industry as well as in manufacturing industry to reduce lead time, improve quality and productivity by eliminating wastes in the system. Below is example of wastes in the call center. Many companies try to imitate Toyota Production System, but most of them fail to achieve the performance of Toyota. The tools and practices such as Kanban pull system, U-shaped cell, leveled production, standard work, Jidoka, etc. that have received attention are not fundamental to TPS, they are responses to site-specific challenges. The Rules-In-Use or DNA differentiates TPS from other production systems. In short, there are three rules for Design and Operation, and for two rules for improvement. Rule 1: Design and perform each activity so that it is structured and self-diagnostic. Rule 2: Design and operate each customer-supplier connection so that it is direct, binary and self-diagnostic. Rule 3: Design and operate the flow-path for every goods, service and information so that it is simple, pre-specified, and self-diagnostic. Rule 4: Improve and solve problems regarding activities using scientific method, under the guidance of a teacher (Sensei), as the lowest possible level in the organization. Rule 5: Improve and solve problems regarding connections and flow-path using the scientific method, under the guidance of a teacher (Sensei), as the lowest possible level in the organization. The key is line workers are doing improvement works under the expert guidance of a Lean Sensei and being fully supported by top management. Besides that, scientific method such as to hypothesis, test and verify the problems/results/improvement plans are an intrinsic part of TPS.